The Eastern Pennsylvania district has been involved in campaigns to raise the minimum wage and to support public education in Philadelphia and throughout the state. Some of our members are active in building the climate march and in working on the midterm election. We are hopeful that the broad developing coalition can change who the Governor is in November. Some of our members are working with their unions; others are active with Working America and involved in the campaign to defeat Tom Corbett and elect Democrat Tom Wolf. We sponsor public forums such as one with Professor Walter Howard of Bloomsburg University speaking on the history of the struggle for the right to vote and against voter suppression. Another presented CP Political Action Chair Joelle Fishman on the topic “Women Rising: the key to defeating the ultra Right in 2014”. 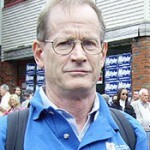 Our forums are presented under the auspices of the Philadelphia Social Science Forum which is a project of the EPA District and the Friends of peoplesworld.org. 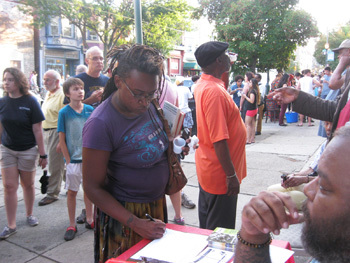 The attached photos are from June of this year when the West Philadelphia Club went on the street during the neighborhood “Dollar Stroll” to gather signatures on our petition to raise the minimum wage. We also distributed Party literature. The “Dollar Stroll” is a popular community event when local merchants (including bookstores, restaurants and bars) sell merchandise for a dollar.